funeral monument of a prominent Roman, one Lucius Alfius Statius, from the period of the early Empire—around the birth of Christ. The photograph attached shows the funeral monument of a prominent Roman, one Lucius Alfius Statius, from the period of the early Empire—around the birth of Christ. It was found in Aquileia, via Petrada, in north-eastern Italy. Underneath the inscription are the seven tools of a Master Mason. Parallel to the lower edge of the writing, we see a gauge (regula) with measuring lines for different distances and lengths. At the left under it are a setting level and a plumb-bob with a cord. The compass (circulus), square (norma), setting maul (malleus) and five chisels (scalprum) or these might possibly be sticks of chalk or charcoal. 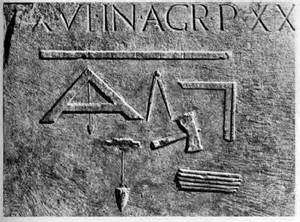 Were these designs simply the "doodling" of the man who carved the stone – just an illustration of the tools Statius used in his business? Or did they have a deeper significance, an indication that the carver – or Lucius Alfius Statius – was a member of a fraternal organization already well-established two thousand years ago? Nah! Couldn't be… Could it?